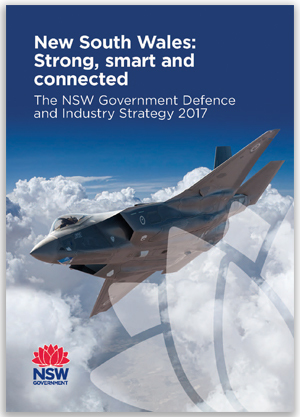 The Minister for Trade and Industry launched NSW: Strong, smart and connected, the NSW Government Defence and Industry Strategy, in February 2017. The strategy represents the NSW Government’s vision for supporting defence and growing defence industries and related jobs, investment and innovation across the state. The strategy recognises the major contribution defence makes to NSW, and the critical role NSW has in delivering the capability defence requires. It also supports the sustained growth and emerging specialisation areas within the NSW defence industry. Importantly, the strategy provides a centralised platform to support more effective leadership, advocacy, and engagement with defence and collaboration with the defence industry. NSW is home to the largest number of defence bases and capabilities of any state or territory and is home to one quarter of Australia’s military and defence civilian personnel. All three services have significant bases throughout the state, including major sustainment hubs for the Australian Army at Holsworthy Barracks, the Royal Australian Navy at Garden Island and the Royal Australian Air Force at Williamtown. Each service has operational level headquarters and significant training units located across the state. The state has the highest number of workers with skills relevant to defence industry and these closely align with key areas of future growth and investment. NSW is also home to world-class universities and other research and development institutions that have active research programs in support of defence technology. The leading defence companies operating in Australia all have a headquarters or a major presence in NSW. The NSW Government will work closely with the defence industry to attract increased defence investment in the state and help small and medium sized enterprises gain better access to local and global supply chain opportunities.